SAY Sí students have high hopes for the 2018 Story Seldom Told: Omitted Histories exhibit. 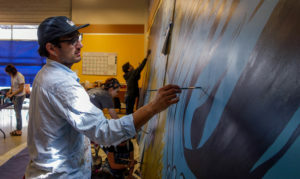 Visual Art students spent the last few weeks preparing for the exhibition by working with Texas muralist Zeke Peña to create a mural illustrating how some San Antonio Natives used astronomy and geography to analyze and understand the land and rivers. Zeke Peña is a visual artist from El Paso, Texas. He started learning how to make art in grade school and moved on to drawing comics and painting mostly improvised murals. Peña eventually earned a degree in art history later in his artistic career. He traveled to San Antonio specifically to work with SAY Sí to teach students about activating history through art and its impact on the community. A group of 10 SAY Sí student-artists were selected to participate in artist workshops with Peña and make a detailed mural for this year’s Stories Seldom Told exhibit. Students learned about the importance of carefully handling and interpreting the stories of individuals. Peña taught SAY Sí students about the different stages of a mural from the perspective of both a historian and a storyteller. He describes murals as a “continuous process” that unfolds as it is being created. “It was a really great experience; it really widened my artistic knowledge by showing how history and art combine,” said E.K. Lewis, Age 16, a student from the VA studio working on the mural. The mural workshop students are now completing the final details of the mural and preparing to set up for display. Peña has described SAY Sí as one of the best groups he has collaborated with because of students’ willingness and open-minded attitudes in their art-making process. The mural will be unveiled to the community at the Story Seldom Told: Omitted Histories exhibit opening night, May 4, 2018, 6 – 10 p.m., and will be installed outside the building after the exhibit closes. SAY Sí middle and high school student-artists have officially started working on their Stories Seldom Told installations. 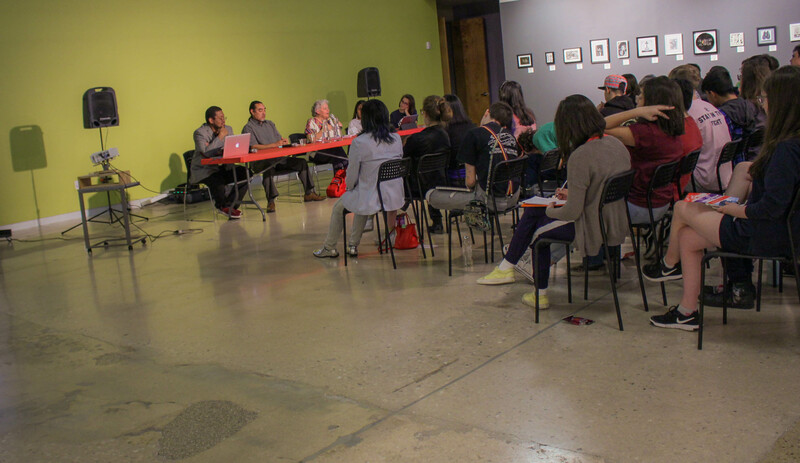 Getting ready for the month-long exhibition, students switch studios and collaborate to discuss hidden stories within San Antonio communities. With this exhibition students are experimenting with multi-media art techniques and learning the importance of in-depth research. Similar to previous Story Seldom Told exhibits, artists develop their work around a student-chosen theme relevant to their community. This exhibit will give a voice to individuals and communities that have historically been concealed in the narrative of the region. Currently, students are working toward communicating these rich histories to the community through large-scale installation art which will be portrayed at the opening of the show on May 4th, 2018, 6 – 10 p.m. In the past few weeks students have focused on research by gathering accurate information to illustrate in their artwork. Students are developing the foundations of their projects by learning about the diversity behind San Antonio and uncovering stories supplemental to their research. One way students have been exposed to new information is by listening and speaking to visiting artists. 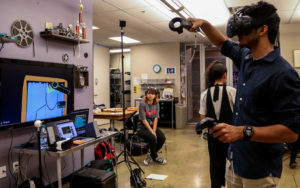 These vary from experts within the historical architecture of the community to young artists teaching students about the future of virtual and augmented reality. Many students are using what they have learned from these artists to make interactive and multimedia projects elevating the level of storytelling in their work. Relying on the research and storytelling aspects of Stories Seldom Told, SAY Sí is definitely excited to showcase the students’ artworks in the upcoming exhibit and to reveal local stories that should be considered part of the city’s history.